The topic of a bailout bottle will come up sooner or later. During your initial training you were taught how to use your buddy’s safe second or even how to buddy breath on your buddy’s regulator. The use of a bail out bottle is barely covered. •	Integrated first and second stage regulator into the bottle. •	Stand alone tank with a standard first stage and second stage regulator. Which one is for you? well that will depend on your type of diving. I have always believed that if you carry a bail out bottle, it should be enough to get you from depth to the surface. The integrated first and second stage regulator into the bottle usually costs less, but you get less air. These types of bottles are the Spare Air and H2Oddesy products. 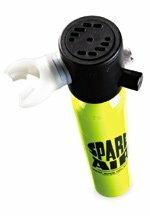 The Spare Air comes in two popular sizes; 3.0 cubic foot and 1.7 cubic foot models. The 3.0 size will get you to the surface from 70 feet. The 1.7 size will get you to the surface from 45 feet. While the physical size is appealing, I prefer a little more air. The H2Oddesy is a full 6 cubic foot tank. This will get you from 132 feet all the way to the surface. The cost is pretty reasonable at $299 for the emergency air. The problem with the H2Oddesy is that a diver can get a 13 cubic foot tank, spare standard first stage regulator with a second stage, a pressure gauge and a bracket or holding bag for about $399. 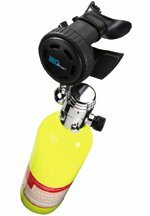 This type of setup will not only allow both you and your buddy to the surface, but now you will have a backup regulator if needed on the dive trip. There could be some travel considerations for you and your bailout bottle. Remember that when traveling on an airplane, all Scuba tanks must be empty to be placed on board the plane. If you forget your fill adapter on the Spare Air, some dive shops cannot fill it. When do I use a bailout bottle? It is usually on advanced dives to 130 feet or diving off of a ship wreck. For those simple beach dives, I usually skip hauling the extra equipment.